Tuesday I played in a pickleball tournament at a local recreation center. My partner Tish and I had never played in a tournament together and, in fact, don't even play at the same locations very often. It is a huge benefit to have the same partner in tournaments as you get used to how the other person plays and can get in sync with each other. Nevertheless, we decided to give it a shot. I did at least meet her Sunday afternoon at the center where the tournament was being held so that I could get a feel for the playing surface. They have a sport court as their gym floor, and it is quite different from the wooden floors I am used to playing on. I really liked it as there is no glare and with a softer surface, it is easier on the feet and legs. But the ball definitely plays different on that kind of surface. On Tuesday we arrived early at the center to warm up. It was not a huge tournament, and we ended up playing six games. One was against a team ranked lower than us, and two were against teams ranked higher than us, so those three games did not end up counting in the standings. We beat all three teams that were at our level, so we ended up getting gold medals. One of these other teams had taken gold at the last two tournaments held at this center, so that made us feel particularly good about our play. It was a fun time! 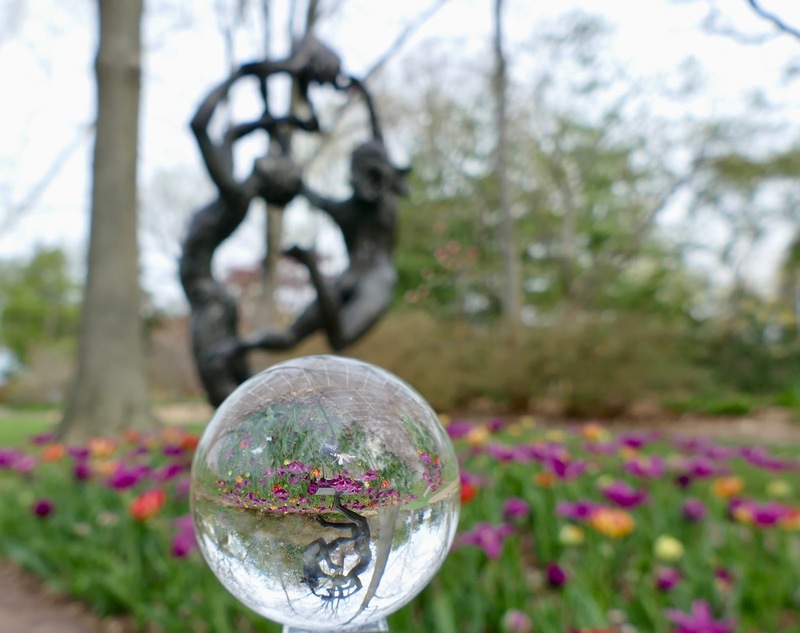 Though my legs were quite tired from all the pickleball the day before, yesterday I went to the Missouri Botanical Garden to see what was in bloom. 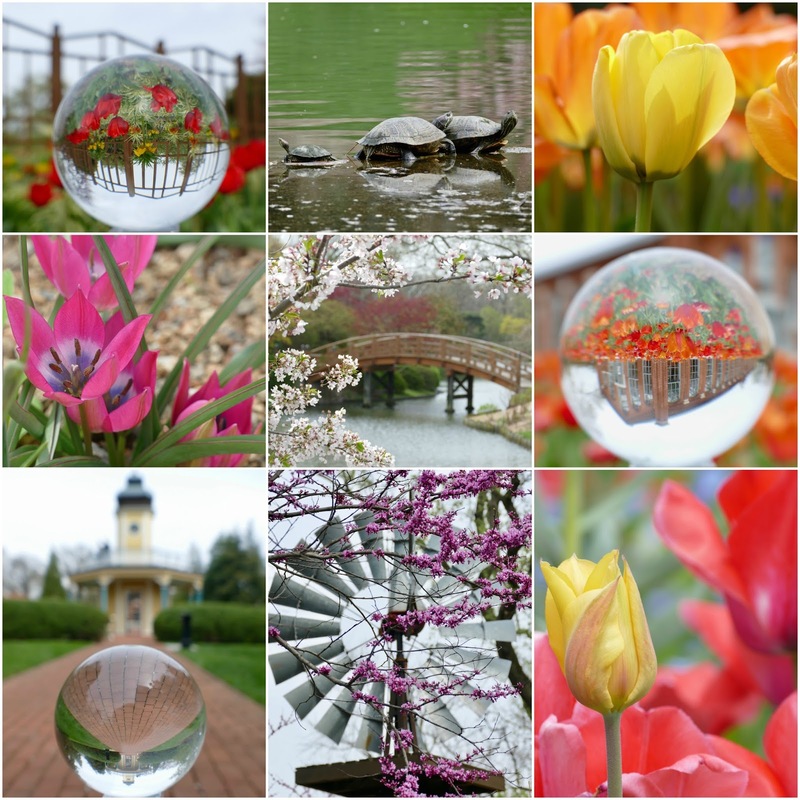 Things change so rapidly there this time of year that you almost need to go once a week to check it out. 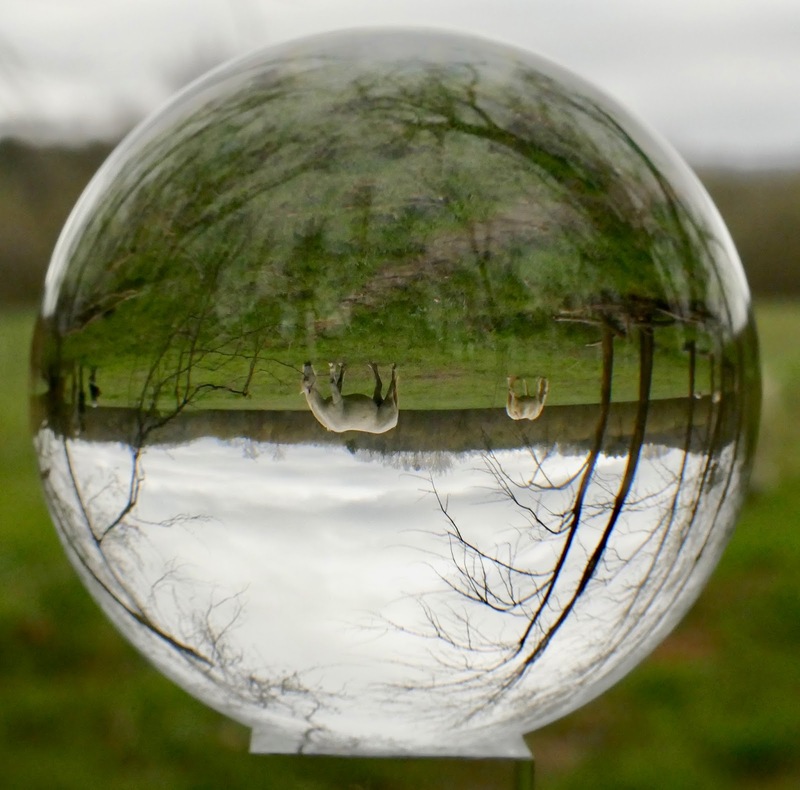 I took my crystal ball along as I wanted to play around with it. I hadn't been in the garden more than 15 minutes when a couple of Asian women stopped to see what I was doing. They asked if they could take some shots through the ball, and they had a blast working with it. Along the way several children came over to see what I was doing, and it was fun to show them how the thing you are looking at appears upside down in the ball. But then another strange thing happened. Two Mideastern women dressed in traditional abayas and hijabs stopped me along one of the paths. They did not speak English, and one was gesturing with her phone. Assuming that she was wanting me to take their picture together, I reached for the phone. The woman quickly pulled it back, and they both began to speak and move their hands. I finally realized that one of the women wanted a picture of herself with me, which the other woman took with the phone. That reminded me of the time Jim and I went to Redwoods National Forest with Andy when he was about 11 months old. A huge bus filled with Asian tourists pulled into the parking lot where we were standing. One of them ran over, snatched Andy out of my arms, and proceeded to hold him in their group photo. It happened so fast that we were stunned, and he was screaming his head off! The garden was quite busy, especially as I counted three school groups wandering through. It was a pretty day, party cloudy with the temperature around 70. 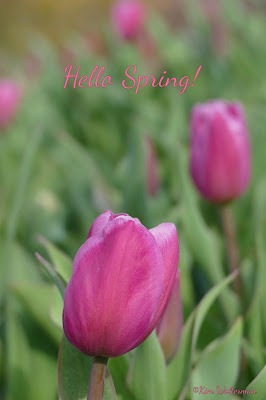 I think everyone was so tired of winter that they welcomed a day outside with the beautiful flowers, trees and shrubs. Before I go next time, maybe I should consult my crystal ball to see how crowded it will be. Ha! Friday afternoon, while a bit cloudy, was warm enough for us to eat lunch outside at the Creekside Grill in Echo Bluff State Park. But it began to rain shortly after we checked into our cabin at Riverside, which was actually located quite a distance from the motel - far enough that we drove to get to it. And the five cabins were, oddly enough, on a gravel rode stuck in amongst cabins owned by other establishments. We had been advised that we were the only ones using the Riverside cabins Friday night. We threw our stuff into the cabin, and then sat out on our patio to watch the river flow by. It was very peaceful - then. As it was raining more heavily, we drove back to the motel shortly before 7:00 to meet up with the other photographers who were participating in the workshop. There were only four of us, plus the instructor, which was great. The instructor went over settings on our cameras that would be most conducive to photographing moving horses, as well as safety instructions to being around these wild animals. Then we were advised to meet in the parking lot at 6:00 a.m. on Saturday. But some excitement was in store before our 5:30 wakeup alarm. Around 9:00 the storm began in earnest, with high winds, lightning, thunder and torrential rains. We had no cell service in the area, and particularly none at the cabin. The motel's wifi didn't even work there. Next the tornado sirens went off, so I quickly put on the television to find a weather report. There were tornado cells to the southwest of Eminence, tracking to the northeast. In other words, heading our way. Additionally, flash flood warnings had been issued for our town. As we were contemplating where exactly we should go to be safe, the satellite went out! We had no basement, of course, and no bathtub to climb into. We were in a small cabin, after all. We didn't know if it was safe to leave in our car, or if the town of 600 some people even had a storm shelter. I relaxed a little when the tornado sirens ended, though in the pitch black I had no idea how quickly the nearby river was rising. But the sirens went off a second time, and I could only hope that the owners of the resort or the town sheriff would check on us if the river threatened to carry the cabin away. Needless to say, very little sleep was to be had that night between the stress and continued booms of thunder, and we were both awake before 5:00. At that point it was still too dark to see how much the river had risen during the night, but it wasn't coming in under the back door of the cabin so that was encouraging. We gathered with our group a little before 6:00, and while the day was pretty gray the rain had fizzled out to a light mist. We loaded up in two cars and went to the first field to see if any horses were around. There was no chance of sunrise shots with the herd of three that we found, and the lighting conditions made taking pictures a bit of a challenge. As the day progressed the light improved somewhat. We spent an hour or so at this location before driving to a second field where around a dozen horses were hanging out. I should mention that the instructor has a way of communicating the the lead mare of each of the herds. She would enter the field by herself at first, and once she established that the leader was okay with us being there, we could follow her into the space. It was quite something to see. The second herd less skittish than the first, so we spent quite a bit of time with them both in the field and then in the woods nearby. We went for a late breakfast, then headed to our respective rooms to rest up a bit. We were pleased to see the river was nowhere near our cabin, and we settled in to look at our morning pictures as we were to each bring several to the instructor's room at 2:00. When the group reconvened we reviewed photos, and were given suggestions on other things to try when we went back out at 5:00 to try for some sunset photos. While the sun did peek out for a bit late that afternoon, there was no sunset. All the rains from the last 24 hours did create a pop up pond in the field, though, and that made for some great reflection photos. Saturday night we had dinner together at the Mexican restaurant across the street from the motel, and turned in early as we were all exhausted. Sunday morning we met at 6:00 for one last photo shoot. Again, there was no sun and in fact we had some rain during the morning. The temperature was only 37 - what a contrast from Saturday morning when it was 60 as we started out early in the morning! But we found both herds again, and got some great pictures. Then we had one last breakfast as a group before everyone took off for home. I think Jim summed it up best when he said to everyone, "Best Christmas present I have ever given my wife!" 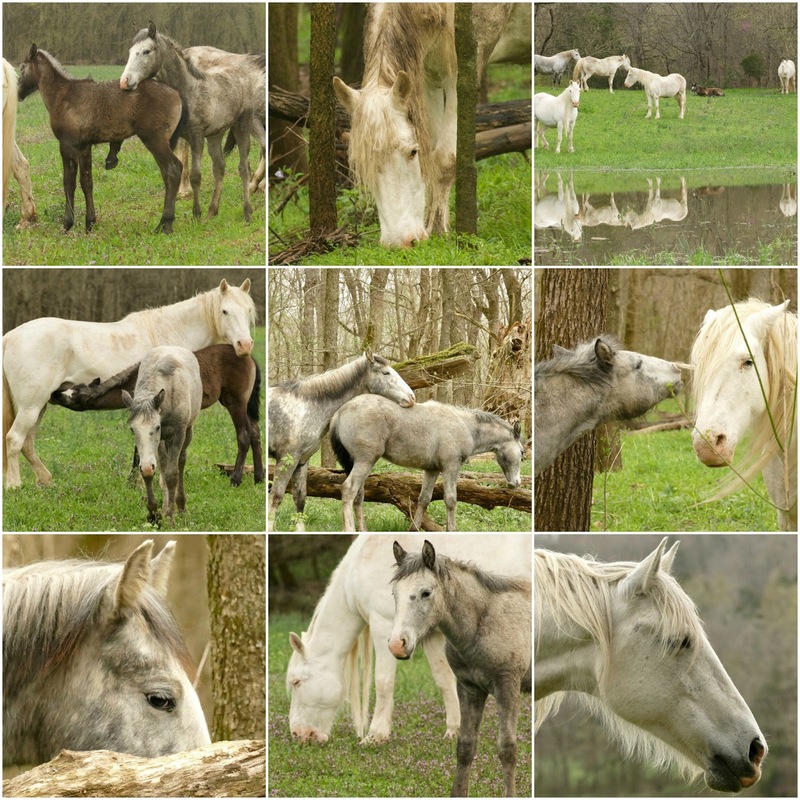 Last weekend we photographed the wild horses in Shannon County, Missouri. But I almost didn't get to go. Wednesday afternoon I was working away on the computer when it seemed that my left eye was not focusing correctly. When Jim and I went for a walk that night, I noticed that it had gotten worse, and I was seeing a blob out of the left eye. It was moving like a floater, but it was rather large and shaped like a vertically squished circle. But then I saw some white flashes like lightning on the left side of the eye, and that was very disconcerting. The American Academy of Ophthalmology website lists these things as possible indicators of a torn or detached retina. It further warns that if prompt attention isn't paid to the eye, blindness can occur. Well, that certainly sounded scary. The next morning I called my ophthalmology practice and explained what was going on. They agreed I should have it looked at, and scheduled me with the retina specialist at 12:40. I skipped my morning pickleball just to be on the safe side. After thorough testing, the retina doctor said she could see what I was referring to, but my eye pressure was good and there were no signs of any tear or detachment. She explained it was just a big old floater, and that each eye will most likely have something like this. The average age is 67 when it occurs, but she added that nearsighted people get them earlier. In 85% of the cases they disappear on their own. If I am one of the unlucky 15%, I can decide if I want to live with it or have it removed by laser surgery. Unfortunately it cannot be removed when I have the cataract surgery done. So, bottom line was good news and a clearance to make the drive to Shannon County the next day. For Christmas Jim had given me a gift certificate to attend a workshop about photographing the wild horses in Shannon County, Missouri that was offered through the Academy of Nature and Wildlife Arts. As background on the horses, it is believed that the herd formed after residents left their livestock behind during the great depression. 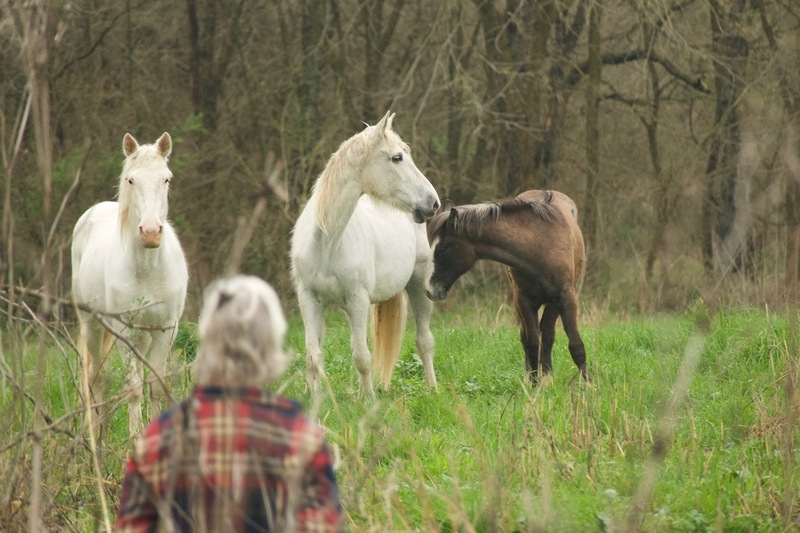 Though there was an effort by federal officials to remove the horses in the 1990s, local protesters intervened and petitioned the National Park Service office in Shannon County. Legislation was passed to protect the animals, with the condition that the herd remain at 50 horses. 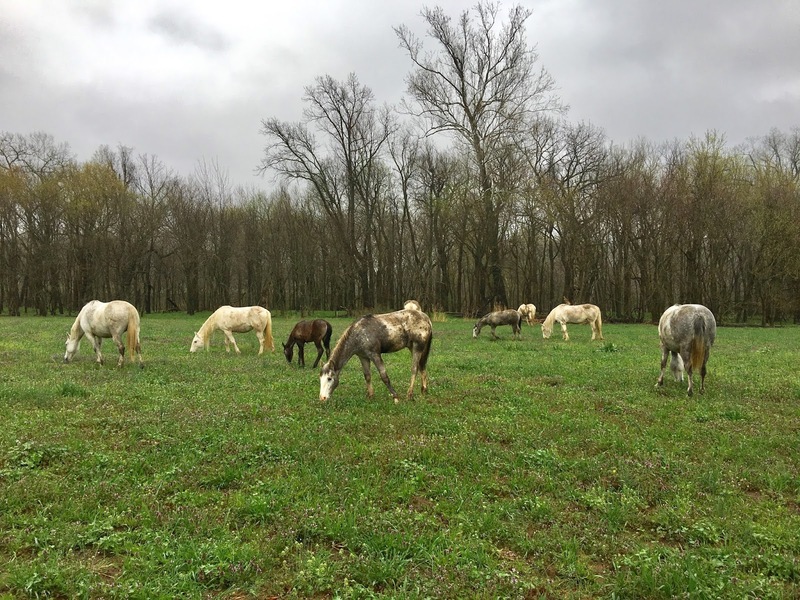 When the number grows, the Missouri Wild Horse League rounds up some of the younger stallions, who are tamed and then adopted by local farmers. 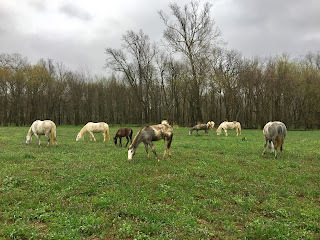 The herd roams free on land located in the Mark Twain National Forest. 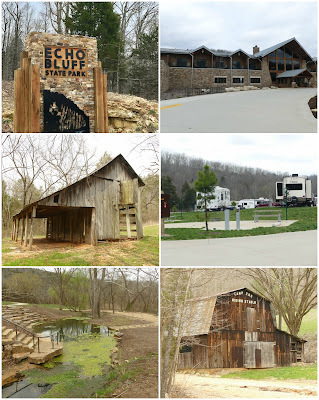 On the way to Eminence, where our base would be for the weekend, we stopped at Echo Bluff State Park. A project of SWT Design, I had heard about the park for years and had seen many pictures of it during and after construction. But I had not yet seen it in person. Missouri's newest state park opened in 2016, so everything is still pretty new and sparkly. It will take time for the added vegetation to mature, but in terms of camping or glamping, the park has something for everyone. Tent campers will find themselves on wooden platforms, the campers and RVs are on a nice concrete pad with good facilities nearby, the main lodge offers rooms and a restaurant, and cabins built for singles and large families are also offered. The lodge is located near the echoing river bluffs, from whence the park got its name. The park has been so popular that reservations need to be made a year in advance for weekends or any day during the summer. It has also become a wedding destination, which was not something that was anticipated. It is a wonderful park, and I appreciate how they kept several of the old structures from when the property was Camp Zoe. Following lunch at the lodge, we got back on windy, hilly, narrow Highway 19 and made our way to Alley Spring. Located in the Ozark National Scenic Riverways, Missouri's 7th largest spring discharges 81 million gallons of water each day. The grain mill at the site was constructed in 1893, replacing an earlier mill that had been built in 1868. 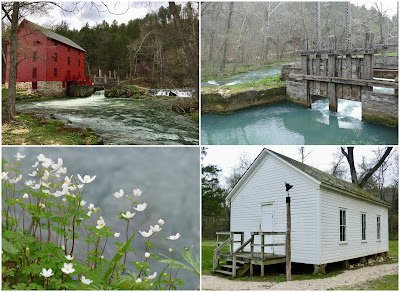 It was a wheel-less mill, operating instead on a turbine system. The mill closed in 1918. It has been preserved by the National Park Service, along with a one-room schoolhouse that is located nearby. By late afternoon we made our way into Eminence and checked into the Riverside Properties. Located on the Jack's Fork River, the choice of accommodations includes the motel or cabins. Some cabins are located along the river while others are across Highway 19 from the motel. We could have stayed anywhere around Eminence, but the workshop instructor had a room at Riverside and would be having meetings with the group there. We opted for one of the cabins along the river so we could have some cooking facilities and the ambience of the river out back. The cabins went under water when the river flooded last year, so they were touted to be recently renovated. The decision to stay in the cabins ended up to be a cause for concern that evening when turbulent weather rolled into the area. The weather has been so goofy, with above average cloud cover and rain, and below average temperatures. And not just in our area, but across many parts of the U.S. We are all just sick of it. I can take the cooler temperatures, but bring on the sun for crying out loud! If I wanted clouds and rain, I'd live in Seattle. Today brought sunshine and temperatures finally in the 70s. It won't last for long as they are calling for rain on Saturday and a high of 42 on Sunday. I decided to make a break for it and headed to the Missouri Botanical Garden. I arrived shortly after 9, and there were not too many people in the garden yet. Many of the magnolia trees and bushes were impacted by the cold temperatures, so they were not very pretty. But the spring bulb plants were up and showing off their colorful little faces. 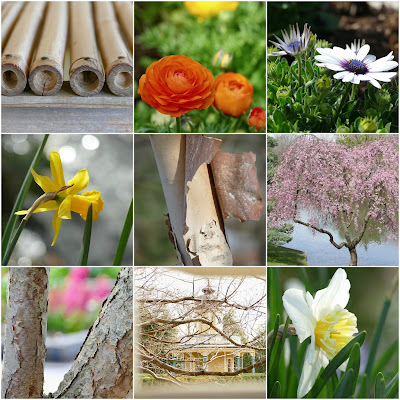 It was a treat to be able to walk through the garden without a coat, stopping to take as many pictures as I desired without having anyone grumble about how long I was taking to get the shot I was after. The garden will be in much better display in a couple of weeks, but for today it was a perfect way to get me out of the elongated winter doldrums. Unless you have been living off-planet, you have probably heard of the musical Hamilton. It received a record number of Tony nominations in 2016, winning 11 of the 16 awards for which it was nominated. The Grammy award for Best Musical Theater Album also went to Hamilton in 2016. Despite all of that hype, I knew little of the play other than the fact that it depicted the life of Alexander Hamilton. I never listened to the music as I was told it was "all rap and you won't like it." 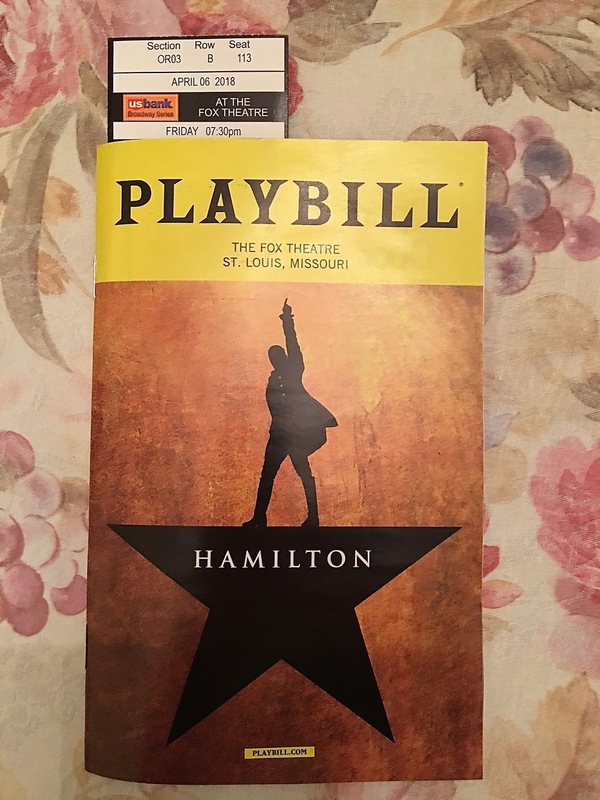 As season ticket subscribers to the Fox Theatre, Hamilton was part of our series of shows for 2017-2018. For the first time ever, as subscribers we were not allowed to purchase any additional tickets for a play before tickets went on sale to the general public. For all other shows, we can pick up extra tickets if we want. We were not sure if we even wanted to see Hamilton, especially after we saw the tickets in the same row as ours listed on StubHub for $1,500 each. Wow! More than ten times the purchase price as we don't pay the listed price on the tickets as subscribers. I have to admit, we were tempted to put our tickets up as well. I am so grateful we did not do it. Someone suggested to us that we listen to the soundtrack of the show first, so I borrowed it from the library. That was a game-changer, for a number of reasons. First of all, we LOVED the music, even the hip hop and rap. Second, there is a lot going on with the music, and sometimes it was difficult to understand what was being said. Having the lyrics printed out so we could follow along helped immensely. Finally, listening to the music a few times before seeing the show made it easier for us to follow along. Plus we could pay attention to the other actors on stage, the costumes, the choreography and the lighting since we didn't have to concentrate so much on the words. Our tickets were for last night, and we knew there would be a crush of people jockeying for parking and entering the theater. We went early and easily found a parking spot on the street before heading to the Triumph Grill for an early dinner before the show. From the restaurant it's an easy walk to the Fox Theatre, where there was quite a crowd at the doors. The Fox recently added body scans with a wand to the purse checks, so it takes awhile to get people in. I think that is the only show we have attended at the Fox that was 100% sold out. The energy in the theater was so different than we have ever experienced. Expectations were high, and the actors did not let the audience down. The crowd responded in kind, cheering, clapping and whistling after each song was completed. Everything about the musical was exceptional, and it was without a doubt the best show I have ever seen. Before the last note ended, the entire house was on its feet. I'm so happy I didn't throw away my shot to see Hamilton.